Thirty-five years after the release of the original “Blade Runner” movie comes its long awaited sequel, “2049”. The 1982 science fiction, cult classic has grown on me as of late. But it is worth noting that 2007’s “The Final Cut” is the only one of the seven versions of the film I have seen. is widely regarded as the definitive version; I would highly recommend giving it a watch before checking out this new movie. Scott returned in the role of an executive producer this time around, with acclaimed director Denis Villeneuve (“Prisoners” and “Arrival”) taking over the helm. Harrison Ford once again portrays Rick Deckard, highlighting a handful of cast members who reprised their roles from the original film. “Blade Runner 2049” takes place thirty years after the events of its predecessor and is once again set in the city of Los Angeles. The area remains a crowded, dreary place in this dystopian world, defined by industry and “replicants”. Designed to look like humans, replicants are pretty much androids, primarily used for manual labor in this dark vision of the future. 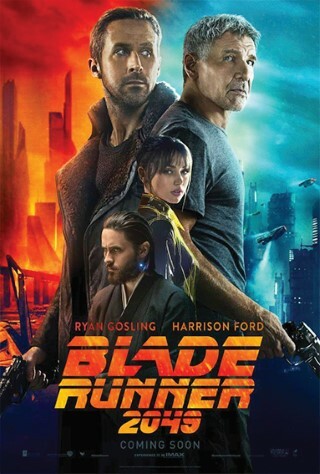 During the first film, all replicants were outlawed on Earth due to their violent nature, and it was Rick Deckard's job as a “Blade Runner” to eliminate them. This time around, Ryan Gosling plays LAPD Officer K, who assumes the same position thirty years later. However, the times have changed, and K is a replicant himself who is responsible for killing older, outlawed models of his own kind. Eventually, K uncovers a shocking secret that traces back to Deckard - forcing him out of hiding. Thankfully, “Blade Runner 2049” isn’t quite like the countless other sequels and reboots that Hollywood has been dishing out during the past decade or so. It actually functions well in supplementing, and more importantly - building upon, the source material of its predecessor. Gosling adds another excellent performance to his impressive résumé here, carrying the audience through the visually stunning depiction of this already rich universe. Harrison Ford did a great job as well, and I think it was a very wise, storytelling decision to save Rick Deckard’s screen presence for the dramatic last act of the film. The only other thing I could ask out of “Blade Runner 2049” is more viewings to unravel its thematically deep and heavily layered story. Any fan of the original, science fiction films, or movies in general should check this one out; it may very well be a classic in 2049.